The show is hosted by Geordie Smug Twats, Ant and Dec, pictured here shortly before the infamous "smiting" incident of 2006. For the religious among us who choose to believe lies, the so-called experts at Wikipedia have an article about I'm an Ascended Master.....Get Me OUT of Here!. I'm an Ascended Master... Get Me OUT of Here! is a UK reality television show in which minor deities and spiritual masters live in jungle conditions with few creature comforts. The show is filmed live in Australia and broadcast on ITV in the United Kingdom. The show is primarily considered as a vehicle for B List Divinities to raise their profile, although in recent years a number of A Listers have featured. First aired in 2001, the show has now completed its seventh season. Initially the shows producers had difficulty recruiting a host for the program as atheists refused to believe in the existence of the deities, and followers of different faiths would only believe in their own. A compromise was however found by recruiting popular TV personalities Ant and Dec, wellknown "Tyneside Wonder Amateur Televisionists" who are immune to theological debate. Two series have also been aired in Germany - entitled "Ich bin ein Gott - Holt mich hier raus". There are also French and Dutch versions of the show called respectively "Je suis une divinité, sortez-moi de là!" and "Deu's in de Bush". 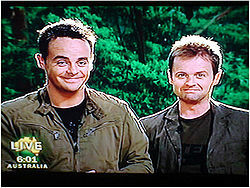 The format of the show revolves around allowing viewers the chance to vote for which Ascended Master they would like to complete a "Bushtucker Trial" — a physical task usually involving snakes, spiders or other creepy-crawlies found in the jungle — and, later in each series, to vote for the spiritual being they would like to see win the show. The winner is given the title "Supreme Being" and are allowed to escape the endless cycle of death and rebirth of the Wheel of Dharma. Each season sees a different combination of deities and spiritual masters battling it out for the love of the watching public. The show is a popular addition to the reality TV genre, and a firm ratings favourite due to the nature of seeing spiritual masters in embarrassing situations. Occasionally unlikely relationships spring up between the contestants, as was seen during the 2003 series when Armenian-Greek mystic G. I. Gurdjieff and Zoroaster began an on-screen romance. Mother Theresa and Vishnu performing one of the shows "Bushtucker Trials". Revelations of sexual activity between contestants has proved to be a major source of controversy for the live TV show. During the 2007 series Allah famously failed miserably to complete the "catch and eat a wild pig" challenge, much to the amusement of his fellow contestants. This lead to a fight in which Deepak Chopra lost two teeth, followed by the surprise departure of angry Germanic sky god Thor. The show's Producers issued a statement that "it is perhaps an unfortunate fact that people of faith often have difficultly in extending spirituality towards those whose faith differs from their own" before being struck by a freak thunderbolt. The decision to include Madonna in the line up for the 2007 season also raised many questions, with many believing that the show had intended to invite the mother of the previous season's winner, Jesus, with whom she shares a name. Controversy surrounded the decision to select the Flying Spaghetti Monster for the 2002 series, as his existence at the time was in some question, and few believed that he would actually turn up. Richard Dawkins, a good friend of the monster was said to be "rather pissed off" when the monster not only showed up, but wiped Peter Gabriel into second place with a flurry of sledgehammer blows from his noodly appendages. After the victory and obvious proof of its own existence the monster spontaneously vanished from reality as its purpose in theological debate had become pointless. Richard Dawkins of course has always been pointless. In the 2004 series it appeared that wise cracking Norman Wisdom was a sure bet for the title until an unfortunate incident in the "can you stop a charging wildebeest" event left him playing the straight man. Stand-up Wisdom was left flat on his back after an attempt to use a series of brilliant monologues failed to subdue the stampeding grasslands mammal. Unfortunately the beast was not a fan of situational comedy and was unaffected by Wisdom's comedic powers. Being well known for his keen observational skills Flying Ace Biggles easily spotted his opportunity and swooped off with that year's spoils, leaving Wisdom trailing behind. The show came under further criticism from a number of sources during the 2005 series, specifically for scenes which showed contestants Mother Theresa and Princess Diana mud wrestling wearing "skimpy" bikinis. Critics stated that the show had resorted to cheap titilation in order to maintain the high viewing figures. Series 2006 was almost completely cancelled after allegations of improper payments being made to Jesus by three mysterious individuals. CCTV footage captured by tabloid newspaper The Sun appeared to clearly show gifts of gold, frankincense and myrrh being left in Jesus' room for no apparent reason. Following Jesus' subsequent poor performance in the next days "How many badgers can you fit in your trousers" competition, allegations of miracle fixing were lodged against Jesus. A press conference was quickly called by ex-Wimbledon player Dennis Wise (who represented the mysterious group) and South African Bruce Grobbelaar (Jesus' agent). During the conference a panel of five FA chief executives questioned the pair who denied any knowledge of the incident. Although our saviour may have taken a bun and the FA executives considered that something fishy was going on, Jesus had no problem feeding the five loaves to the mass of waiting press. The Producers are so pleased with the success of the show that they intend to utilise the same format using popular celebrities from TV and Radio. Ant and Dec are still twats. I&#39;m an Ascended Master.....Get Me OUT of Here!